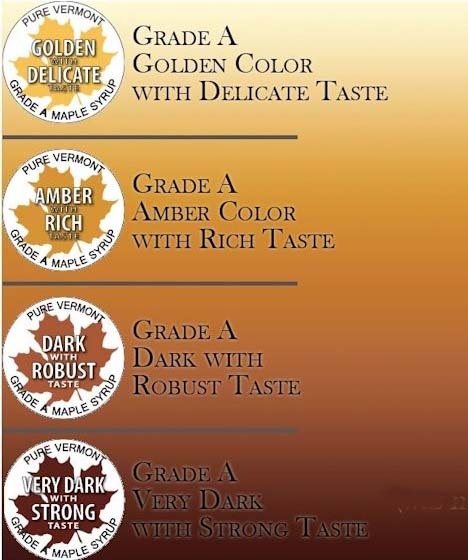 The entire maple syrup industry is in the process of adopting a new grading system which has flavor descriptors as well as color descriptors. Vermont is the first to adopt these as of January 1, 2014. Producers have 1 year to transition into using new grades. Couture's Maple Shop is implementing the new system immediately. The comparison chart below will help you choose a grade that is most suited to your taste. We are still making the same high quality maple syrup that you have come to expect. The new classifications will make choosing a desired flavor intensity more possible, especially if you are not familiar with what the old grading meant.